Da Vinci Myomectomy - Orrego Center for Women´s Health - The full range of gynecologic and obstetrical services. If you are having surgery to remove fibroids (commonly known as myomectomy), your doctor will take out the fibroid(s) and keep your uterus in place. Surgery can be performed using open surgery or minimally invasive surgery (laparoscopy), which also includes da Vinci® Surgery. 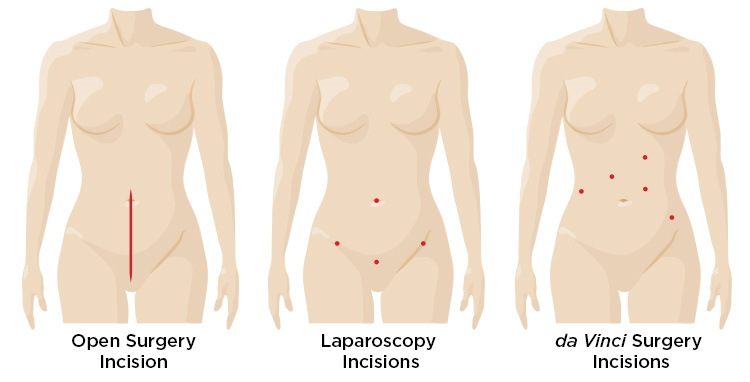 da Vinci technology enables surgeons to operate through a few small incisions (cuts), like traditional laparoscopy, instead of a large open incision. Gobern, Joseph M., C. J. Rosemeyer, James F. Barter, and Albert J. Steren. “Comparison of Robotic, Laparoscopic, and Abdominal Myomectomy in a Community Hospital.” JSLS, Journal of the Society of Laparoendoscopic Surgeons 17.1 (2013): 116-20. Print. Pundir, Jyotsna, Vishal Pundir, Rajalaxmi Walavalkar, Kireki Omanwa, Gillian Lancaster, and Salma Kayani. “Robotic-Assisted Laparoscopic vs Abdominal and Laparoscopic Myomectomy: Systematic Review and Meta-Analysis.” Journal of Minimally Invasive Gynecology 20.3 (2013): 335-45. Print. Ascher-Walsh, Charles J., and Tracy L. Capes. “Robot-assisted Laparoscopic Myomectomy Is an Improvement Over Laparotomy in Women with a Limited Number of Myomas.” Journal of Minimally Invasive Gynecology 17.3 (2010): 306-10. Print. Pluchino, Nicola, Piero Litta, Letizia Freschi, Marinella Russo, Giovanna Simi, Anna N. Santoro, Stefano Angioni, Angiolo Gadducci, and Vito Cela. “Comparison of the Initial Surgical Experience with Robotic and Laparoscopic Myomectomy.” The International Journal of Medical Robotics and Computer Assisted Surgery (2013): N/a. Web.